Andrew Rohrbach tossed a complete game shutout while extending the Dirtbags scoreless inning streak to 30 in a 1-0 pitcher's duel over conference rival Cal State Fullerton. 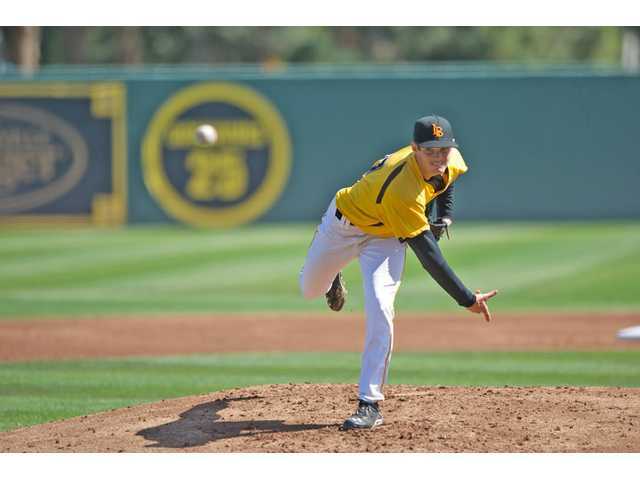 The redshirt sophomore out of Simi Valley High School recorded nine strikeouts and scattered seven hits while outlasting Fullerton's All-American Thomas Eshelman, who also went the distance allowing one run on four hits in just 79 pitches. Neither pitcher walked a batter in this game either. The Dirtbags (22-21, 8-5) scored the only run of the game in the 6th inning when designated hitter Cameron Pongs grounded out to second to score Richard Prigatano, who led off the inning with a double. The signature moment of the game came in the top of the 8th inning when the Titans, after back to back singles, had runners on first and second with no one out. Rohrbach jumped on a bunt by Fullerton's Clay Williamson and retired the lead runner at third. Catcher Eric Hutting on then pounced on a wild pitch and threw to third to nail Titan shortstop Keegan Dale for the second out and then he caught Williamson trying to steal second on a pitchout on two pitches later to help the Dirtbags get out of what appeared to be serious jam while thwarting any opportunity Fullerton (22-19, 6-7) had. Only one Titan baserunner got to third base the entire game and that was in the very first inning by leadoff hitter Clay Williams when he singled, advanced to second on a wild pitch and was balked to third. Rohrbach proceeded to strike out six men in his first three innings of work. Both teams return to action at Blair Field tomorrow with the first pitch set for 2pm.